In an Elsevier researcher survey*, many respondents revealed that they often need to locate information outside their own area of expertise. In fact, 44 percent of these researchers say they search for interdisciplinary information at least once a week. 44 percent of researchers say they search for interdisciplinary information at least once a week. But as we all know, venturing into the vast amount of online literature can leave anyone—even a seasoned researcher— wondering if sources are credible, if information is accurate, and if they are getting to the information they really need quickly enough. It can be easy to veer off path and get lost in the tangled mass of literature. To help researchers, educators and students feel confident that the information they are compiling on a topic is relevant and trustworthy, Elsevier has introduced a new enhancement on ScienceDirect. ScienceDirect Topics offers a free layer of reliable foundational information that helps users take a deeper dive into a given subject, enhancing their research experience on the spot. ScienceDirect Topics not only provides a wealth of critical and relevant information on a topic including definitions and overviews, each topic page also links to the book sources that may be of further interest for deeper exploration. In addition, they include links to related topics, providing a well-rounded resource for those searching for information in a field that is either new to them or outside of their expertise. 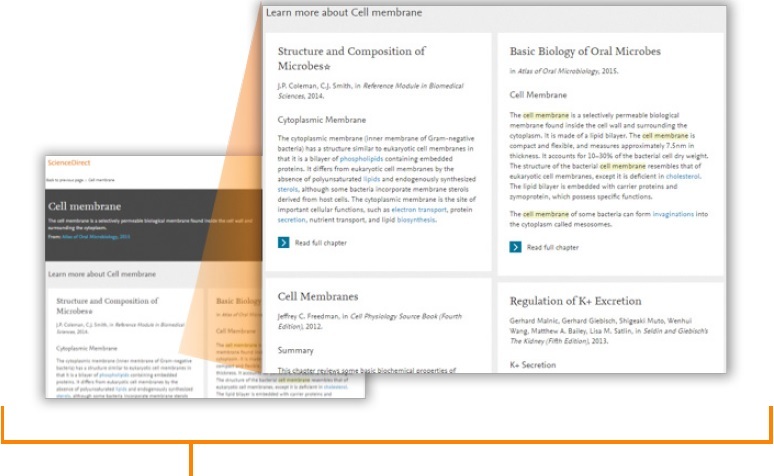 The topic pages are hyperlinked directly from terms within journal articles or can be accessed via search engines to ensure they are accessible at all points in a research workflow. As the amount of scientific data and papers has grown exponentially in the past decade, it is crucial that publishers help all users gain access to the right information—at the time of need. This is ever imperative at institutions where students are not only learning how to research, but also how to find the best and most accurate research for their needs. As a professor at Lafayette, a small liberal arts college with small class sizes, Elaine Reynolds was well aware of the vast amount of misleading information in online sources. From her experiences in the classroom, she knew that students were equally confused, often citing Google searches or Wiki pages as reliable tools for finding information. As a development partner with Elsevier, Elaine conducted a study with the students in two of her classes, a Neurobiology course and an Aging and Age-Related Disease course. The goals for Elaine’s courses, and hence the reason for her study, were simple. She wanted students to be able to demonstrate that they could read and understand original research, including research presented in graphic form. In addition, she wanted students to be able to identify and employ a range of strategies for gathering valid information. Students were then given access to the articles with enhanced features on ScienceDirect. The students were instructed to use ScienceDirect Topics and their traditional research process in other search engines for new class projects. Elaine began by asking her students several questions regarding their research experiences, compiling and charting their answers. Next, she presented the new ScienceDirect Topics that included enhanced reading features as examples in the classroom and encouraged students to use these tools in their own literature searches. 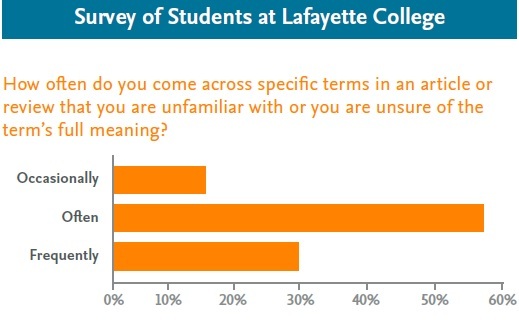 When polled on their experience, after taking the classes and using the topic pages, the students at Lafayette College reported a dramatically enhanced understanding and comfort level when conducting web-based research. Students were more likely to use the tool if they were less comfortable when beginning their research, and showed a greater trend in improvement in comfort level than those that did not use the tool. "I thought it was very helpful. I could contain my searches to the article without wasting time looking information up elsewhere." "…the easy to digest definitions or explanations of scientific terms." "They made the article more clear and provided an easy way to make sure one had a full understanding." Elaine reports that her students gained a greater ability to further curate their own research and felt an increased level of confidence when using ScienceDirect Topics. She noted that the capability to quickly navigate between journal and book content and the access to interdisciplinary research and relevant topics made the new addition a valuable tool for her students. Elsevier constantly strives to bring researchers from all levels of science the tools they need to enhance their work. The addition of ScienceDirect Topics helps researchers and students navigate any topic with confidence, giving them the content they need at just the right time. ScienceDirect will be expanding more than 150,000 topic pages in multiple domains throughout 2017. 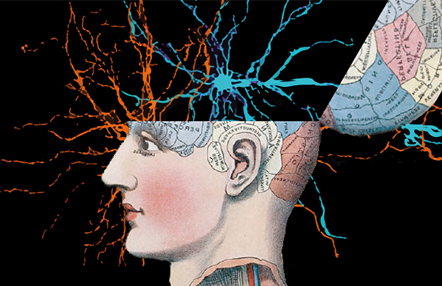 Researchers in the Biomedical Sciences, and the Neurosciences and Life Sciences can already experience these valuable tools now. ScienceDirect Topics is free to ScienceDirect users, and when combined with licensed journal and book content on ScienceDirect, creates a valuable tool for research and learning.